Welcome (hopefully soon) to Saipan, Commonwealth of the Northern Mariana Islands! Located in the western pacific, a short flight from Guam and 3 hours from Japan, the Commonwealth of the Northern Mariana Islands (CNMI) is a popular tourist destination rich in history, culture and natural resources. Saipan, just 5 miles wide by 13 miles long, is the largest and most populated of the 14 islands making up an archipelago that stretches 400 miles (north to south) along the edge of the Marianas Trench. What separate our tours from the standard tour company/cruise ship tours are the off-the-beaten-path sites we visit, the personalities and personnel you'll have a chance to meet, the flexibility and customization and, quite simply, the more intimate experience we offer. We can pick you up at your hotel or at the airport upon your arrival on Saipan. Your tour guide will be chosen from among a unique combination of expats, "locals" (indigenous Chamorro/Carolinian population), non-resident workers, and even a few nomads to give you a unique perspective of life on Saipan! Some of our guides are just regular folks with day jobs who've been trained for the experience, and, depending on their availability from their regular lives, might included local celebrities, historians, long-time residents, teachers, and business owners! Your guide will provide engaging conversation and commentary about the history, people, flora & fauna of the island, and at each site, you'll learn the significance, the history or story/anecdote behind it to keep your experience as enlightening and entertaining as possible. Photographers, history buffs and the generally culture-curious should be ready for a great time! • All prepayments are 100% refundable should plans change. • Credit card sharges appear as "SPN-BKNG" or "SPN-PSNPR"
SAIPAN IN A DAY? YES WE CAN! I call my tours "Saipan in a Day" because whichever focus you select (see options below), I strive to show you as much of the diversity, culture, history, nature and scenic beauty the island has to offer. We typically start at 8:45am (or earlier) and spend the day together until about 4 or 5pm seeing a little bit of everything. It's ideal for anyone who may be arriving on the 8:05am flight from Guam, and departing on the 5pm. Memorial Park Orientation, Carolinian Village, various relics, scenic overlooks, bomb pits, shrines, famous beaches, Bird Island, Banzai Cliff, Suicide Cliff, Forbidden Island overlook, The Grotto and Last Command Post and many other sites and locations all explained in historical, cultural and contemporary context, plus Saipan's unique and unavoidable natural beauty as far as the eye can see! PERSONALIZE TO YOUR PARTICULAR PASSION? YES WE CAN! At the same time, I offer THREE possible "add-ons" for those who wish to customize their tour a little more towards (1)World War II, or (2)scenery/nature, or (3)trekking. These options do not cost any extra, but simply help me plan for your satisfaction! Note: If you'd like to include a visit to the summit of Mount Tapachao (the highest point on island) as part of any of the options below--for a 360 degree panoramic view of the island (and Tinian and beyond on a clear day), or the "Old Man by the Sea" rock formation, such visits will require me to secure a special all-terrain vehicle (Toyota RAV4) for an additonal $22. Saipan is only about 1,300 mi (1,100 nmi; 2,100 km) away from the islands of Japan. It was a very important strategic attack point for the U.S. during the Pacific theater of the second world war. Special focus on every accessible site of signficance, including battle sites, landing beaches, hidden bunkers, torpedos, "the tank on the golf course," plus a possible visit to a private collection of WWII relics (must be arranged in advance; subject to owner's availability and schedule; we suggest making a small courtesy contribution to private collections). For the adventurous, we can take the half-hour trek down to the mysterious and foreboding Forbidden Island and visit a pool in a secret cave, and/or we can take a winding trek through the luscious foliage on our way to the backside of Bird Island, and/or we can trek over the sharp rocks to Turtle Lookout Point in Marpi! It all depends on how fit you are! Over the years, I've arranged one-on-one meetings with Saipan's Amelia Earhart expert; sit down interview with a Carolinian elder for an author writing a book on Micronesian culture; visits to one of the few; Shinto Shrines outside of Japan for a couple doing PhD research on Japanese religion; (Sugar King Park, Old Japanese Jail; visits to members of the Senate and Congres for a history professor from Hawaii, and many more. 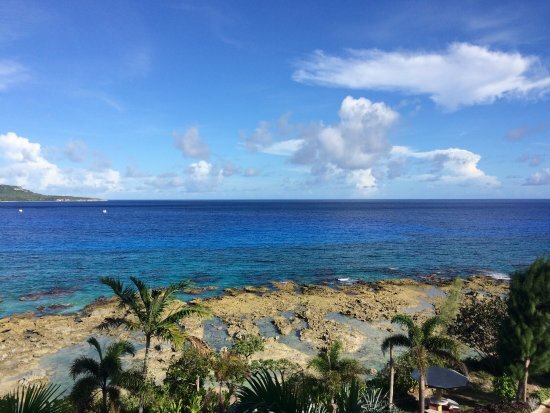 Here's where you can make your Saipan experience your own! Just let me know what your passion is! The 133-acre American Memorial Park encompasses the north end of Micro Beach and Smiling Cove. The Park’s Court of Honour lists the names of US Navy, Marine, and Army servicemen who gave their lives during the fierce fighting for Saipan. The American Memorial Park was built in 1994 for the 50th anniversary of the end of World War II to honor the US Navy, Marine and Army servicemen who gave their lives during the fierce fighting for the World War II, Marianas Island campaign. The central element of the Park, a flag circle/court of honour, was dedicated on the 15th June 1994, to mark the 50th anniversary of the American landings on Saipan. Here, the American flag flies, surrounded by the flags of the US armed services that fought in the battle. The American Memorial Park is designed to be a living memorial. Here, you will view a short, but moving documentary that captures Saipan's Japanese pre-war era, WWII significance. You will see partially-submerged tanks, hidden guns still visible throughout the island from the actual beaches of the American attack on Saipan. You will see and walk through the Last Command Post, a strategically located and fortified mountain cave and outlook from where Japanese commanders directed the troops during the American invasion. As American forces neared victory on Saipan, thousands of Japanese civilians chose death over the shame of surrender, leaping from the high cliffs onto the jagged rocks below. Efforts by US Marine translators to convince the Japanese people not to jump proved fruitless. Approximately 8,000 Japanese civilians committed suicide in the last days of the battle to take the offered privileged place in the afterlife (offered by Emperor Hirohito). Bother Suicide Cliff and Banzaii Cliff have peace memorials and monuments honoring those who died. Was Amelia Earhart in the Old Japanese Jail??? Yes, we believe it's true. Many truths of history and particulary those that involve war are never admitted to the public until years later (think: foreknowledge of Pearl Harbor; staged "attack" on Lusitania). And while it may not yet be acknowledged by official government sources, we, the residents of Saipan, don't need validation because of the numerous, documented and credible eyewitness accounts, research by experts and historians who arrive on Saipan and then arrive at the unmistakable conclusion: Amelia Earhart was captured elsewhere, but imprisoned and executed on the island of Saipan. You will walk through the now roofless hall of the small Old Japanese Jail, a structure that took direct shelling during the Battle of Saipan, and where Amelia Earhart spent her last days. a beautiful sunken pool connected to the ocean by underwater passages--a favorite site for divers! There are 108 steps leading down to the Grotto. Called Isleta Maigo Fahang, "island of sleeping seabirds" by the locals, Bird Island is a small stone islet standing on coral reef. During Japanese rule this place was famous for moon watching. 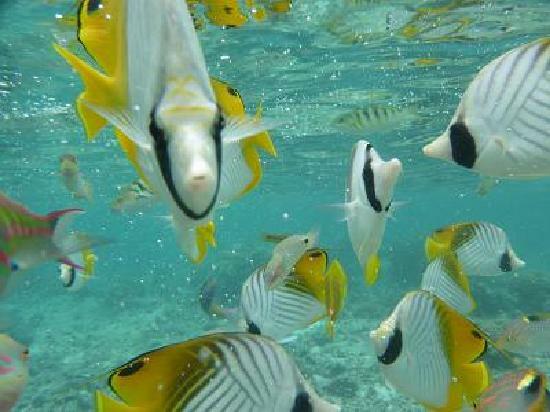 Bird island is known as a paradise for sea birds with many nesting areas dotted 15 feet above sea level. A stunning rock formation located at the southeastern part of the island, Forbidden Island is arguably one of Saipan's most beautiful spots! "I don’t have the full story, but was told (years ago) that area was the home of "Taotaomona" (island spirits). If you did not ask permission before descending to the island, evil would befall you." Are you brave enough to take the chance? Fabian does all of this collecting as his passion and finances it all from his own resources. We suggest that visitors make a donation to help him to continue to provide and maintain this amazing treasure trove of history for future generations. + $20 for RAV4 (four-wheel drive vehicle) for reaching Mount Tapachao, Old Man by the Sea and possibly Forbidden Island depending on weather. 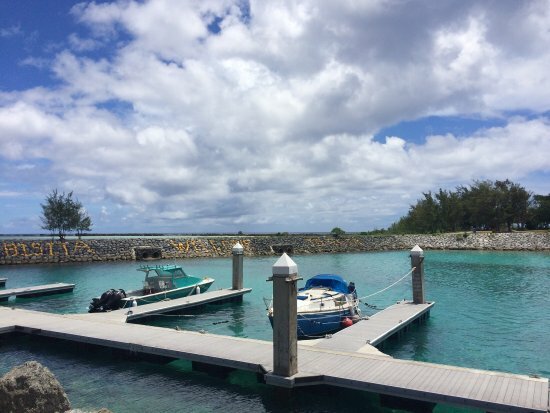 The "Saipan in a Day" relocation tour encompasses circling the entire island, checking out the different neighborhoods, even stopping and inquiring at certain apartment complexes and offices, visiting stores and getting a feel for what it would be like to live here. You'll also get the cultural, historical and scenic tour sites and information as part of our day together. TOUR OPTION: TINIAN ATOMIC BOMB TOUR Tinian is Saipan's sister island and is the site from where the Enola Gay and Bockscar took off on their fateful Hiroshima and Nagasaki attack missions. It would be a shame as well as simply a missed opportunity to come all the way across the world to Saipan, to be so close, and not set foot on the soil of the island from which the Enola Gay took off on its fateful trips to Hiroshima and Nagasaki on missions that changed the course of human history. Experience the stark contrast that exists between then and now (Tinian airfield was the busiest airfield during the entire war), and how this now eerily quiet, remote little piece of rock is fading in people's memories when it is of such critical significance to human history. You will be taken to the main historical sites on Tinian: the bomb pits, the runway from which the Enola Gay took off; The "North Field" which holds significant Japanese and American historical artifacts. You will also see and touch life-sized replicas of the atomic bombs, "Fat Man" and "Little Boy." 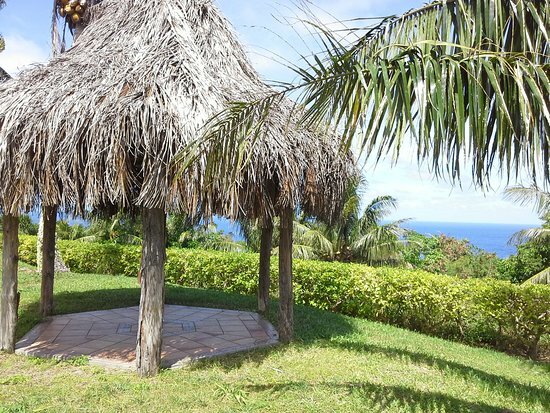 You will also take a trip into the village to see the cultural sites, the House of Taga (legendary chief of modern day Chamorro); and the sites of the largest latte stone pillars in existence as well as Shinto shrines. • Camp Chulu (where all the residents were held captive by the US after the Battle of Tinian) and other relics, sites and natural beauty! Yes, there's a lot to actually see, touch and walk through. However, what's less tangible, and harder to describe in an email is the aspect of your tour that has to do with your very presence on this unique island that changed history. What you can't appreciate until you get there (and until I bring it to your attention) are the contrasts between Tinian then and Tinian now. Seventy-five years ago, this little island was home to THE BUSIEST AIR FIELD IN THE WORLD. Only clients of a certain age, perhaps, and a certain worldview can appreciate the significance of the things I'll point out to you when you stand on that soil today. Some clients have been moved emotionally by the experience. + $215 each additional person. Rota (Chamorro: Luta) also known as the peaceful island, is the southernmost island of the United States Commonwealth of the Northern Mariana Islands (CNMI) and the second southernmost of the Marianas Archipelago. It lies approximately 40 miles north-northeast of the United States territory of Guam. Songsong village is the largest and most populated followed by Sinapalo village (Sinapalu). Rota is approximately 11 miles (17 km) long and 3 miles (5 km) wide. Its pristine coastline is about 38 miles (62 km) long. The highest point on Rota is Mt. Manira which is 1,625 feet (495 m) high. Rota is 47 miles (76 km) north of Guam, and is 63 miles (101 km) south of Tinian and is 73 miles (117 km) south of Saipan. Rota has diverse flora and fauna as well as a latte stone quarry, secret caves, hot springs and more natural beauty than you'll find anywhere! I can arrange a unique tour of Rota. Please inquire for details. + $325 each additional person. + $20 for RAV4 for Mount Tapachao, Old Man by the Sea and possibly Forbidden Island depending on weather. 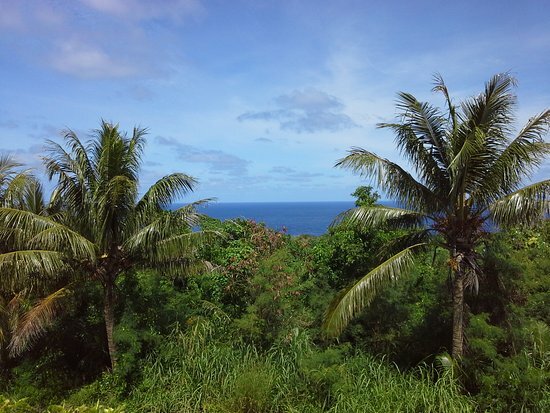 TINIAN Price: $460/first person + $175 each additional person. "Once upon a time, there was a Jamaican civil engineer living in New York who hated his job, followed his passion, started a sideline business publishing his own books, found the courage to quit his job, escaped the rat race, ran off to a tropical island in the Pacific, and started a tourism business so he could give tours of the island to pretty girls (and anyone else, of course) every day...and live a nomadpreneur's dream life." Photo: Me and members of Chinese idol group, SNH48--living my "passionpreneur - nomadpreneur - vegan - minimalist" lifestyle on the island of Saipan!